What new piece of military tech cost us taxpayers around £1 billion but packs a sonar powerful enough to detect ships 3,000 nautical miles and cruise missiles with a range of 1,240 miles? That would be the Royal Navy's latest Astute Class submarine, the HMS Artful which was lowered into the water this weekend. It is one of seven nuclear submarines being built by BAE Systems. The HMS Artful is the third Astute Class submarine to be launched. The first two were the HMS Astute and the HMS Ambush. The last four, the Audacious, Anson, Agamemnon and Ajax are currently under construction in Barrow. The 97 meter submarine weights 7,400 tonnes and is packed to the rafters with the latest tech. According to BAE Systems – the company behind the craft – they are capable of circumnavigating the world without the need to resurface. 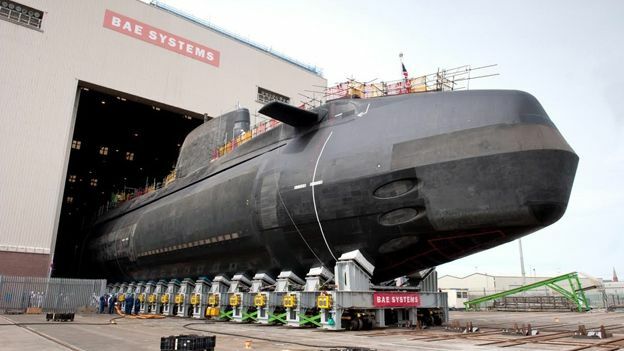 Stuart Godden, Astute programme director for BAE Systems, said: "Moving a submarine of this size from its build hall to the water is very challenging. "It's testament to the experience and careful planning of the team involved that Artful is now ready for the next phase in her programme.